Yeah this is a good, long-running blog – but check Cow Hampshire! Blogs used to be cool and cutting edge but they’ve mostly fallen off people’s radar – the New Hampshire Press Association, for example, no longer awards a blog of the year prize because not enough actual news blogs exist. GraniteGeek is unusual because this has been around for a dozen years, featuring multiple items every week (although you have to make my word for it: most of its early history was lost when I left the Nashua Telegraph). 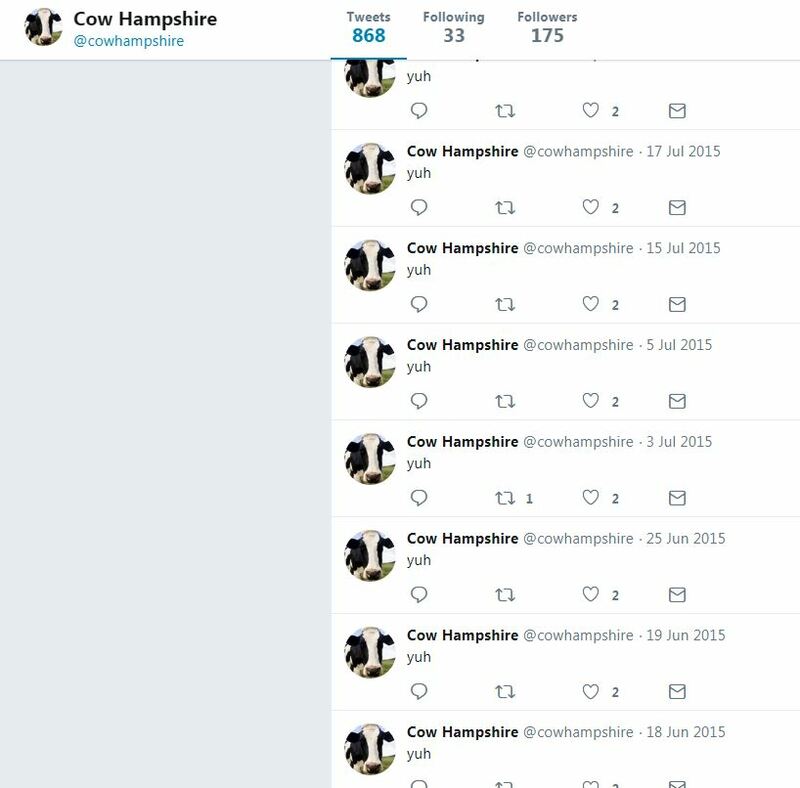 But this longevity is not unique in the state – consider Cow Hampshire. Owen died in 1975 but PlanetMoney interviewed her nieces, who they found only because they were given a heads-up by Janice Brown, author of Cow Hampshire. Brown wrote about her and how she got that weird SSN number a decade ago. Cool! And when I realized the blog had just celebrated its 12th anniversary, I figured I’d do a story about it. No thanks, said Brown. “The more attention I get, the more requests I get for people asking me to help with their research,” she said, and since cow Hampshire is purely a labor of love, with no ads and no plans to turn it into a book or other money-making venture, she’s happy with the traffic she gets. So let’s leave it at that, giving a tip of the hat to a seasoned blog pro – noting that her pieces can provide insight into topics of interest to the geek community, like early N.H. aviation; the mother of forensic science; and food conservation during World War I, to name a few. You can subscribe to it by email, so you won’t miss a trick. 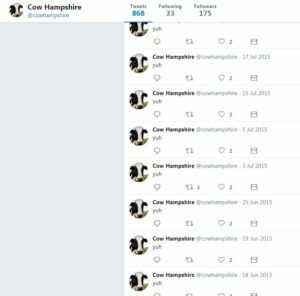 One more minor item: Somebody, not Brown, created a Cow Hampshire Twitter feed dating back to 2010. It consists only of the word “yuh” re-tweeted every few days. Go figure. I wonder how low active SS numbers go now. Mine is 031. Norm, New Hampshire was also issued 002, which is what my own and my sibling’s Social Security numbers begin with, assigned in the 1950s. There are plenty of active numbers in that assigned number range today. Do you mean the first three digits, known as the “area numbers”? Since 2011 they are no longer assigned geographically, but there’s no reason that numbers starting 001 couldn’t still be issued; they haven’t all been used up. Thank you for the nice shout-out. As for Twitter, I use my real name, @JaniceBrown, not an alias. I would have to wonder a bit about someone who bothers to log into a cow twitter using an animal alias on a regular basis. I get the “yuh” part though a “moo” would be more accurate. Cow vocabulary is limited, and perhaps the science behind that would make for a good future story (lol). I’m following your stories here now, and on Twitter. Keep up the great stories. I GOT MY SOCIAL SECURITY CARD IN 1954. THE FIRST THREE NUMBERS WERE 001. SECURITY CARD WAD ISSUED IN 1053. SHE LIVED IN LEBANONH,N.H.